A new exhibition on Edward Burne-Jones thinks outside the Pre-Raphaelite box. Frederick Hollyer, Sir Edward Burne-Jones, William Morris, 1874, platinum print, 1874. Edward Burn-Jones, Love Among the Ruins, 1870-3, watercolor, bodycolor and gum arabic on paper, 96 x 152 cm. Edward Burn-Jones, The Death of Medusa (I), circa 1882, bodycolor on paper, 125 x 117 cm. Sir Edward Coley Burne-Jones has long been the figure in the pantheon of British artists to present art historians with a conundrum. As a painter, Burne-Jones was an absolute outsider, having the audacity to experiment with tried-and-true media like watercolor and oil and painting “what he likes in defiance of what he is,” as his hero John Ruskin once said. As an insult, that sounds fairly innocuous, even inspiring, today, but in Victorian England it must have been a low blow in all its gendered disapproval, for Ruskin elaborated, “Jones, with all his power, paints still weakly as a woman—is essentially a woman.” As a designer and draughtsman, Burne-Jones was also misunderstood, partly due to the dichotomy between the fine arts and the “lesser arts”—as his lifelong friend and collaborator William Morris himself even called them—that had become more or less codified during the 19th century. And so for much of the last century, scholars didn’t know quite what to do with him. Tate Britain (then known as the National Gallery of British Art) did acquire its first work by Burne-Jones, King Cophetua and the Beggar Maid (1884), in 1900, two years after his death, but by then the artist had already fallen far from grace, and prices for his art had dropped still further. In 1904, his widow Georgiana attempted to rehabilitate his image with her two-volume Memorials of Edward Burne-Jones, now considered the most important reference book for anyone writing about the artist. The next decades were even less kind to him, undoubtedly due to the depreciation of the medieval and Renaissance revivalism—and any other historicist or “neo-” style—that had been central to (and had become the namesake of) the Pre-Raphaelite ethos, in favor of the clean slate of modernism. In his classic Pioneers of the Modern Movement, first published in 1936, the architectural historian Nikolaus Pevsner blamed Burne-Jones for what he interpreted as the lack of simplicity or, in his words, “decorative economy,” of Morris & Co.’s stained glass—despite Pevsner’s overwhelming praise for those windows in his other writings. According to Pevsner, William Morris, the grandfather of all that ushered in the new, had been held back by Burne-Jones. Burne-Jones simply wasn’t modern enough. Three years prior, in 1933, the Tate attempted to resurrect Burne-Jones in an exhibition held on the occasion of what would have been his 100th birthday. Eighty-five years have passed since that centennial show, during which the critical reception of Burne-Jones has swung back around. 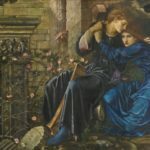 The mid-century flatly saw Burne-Jones as old-fashioned, but the artist’s reputation finally began its full conservation and restoration when the Hayward Gallery in London presented a retrospective in 1975, at the height of England’s infatuation with Victoriana. This was followed in 1998 across the pond by the Metropolitan Museum of Art’s exhibition, not to mention a laundry list of international shows on the Pre-Raphaelites and the Aesthetic Movement. Burne-Jones never attended the usual art academies for designers and artists. In 1853, at 20, he enrolled at Exeter College, Oxford, where he met Morris. The two quickly gave up their study of theology and found other mutual passions. 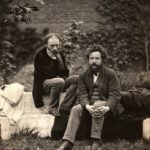 Within a few years, they had befriended their idols, Ruskin and Dante Gabriel Rossetti, the former shepherding the young Burne-Jones in Italy twice, the latter becoming his informal bottega master. Burne-Jones and Morris quickly reoriented their goals from religion toward the cult of beauty, working together as artist-designers with the establishment of the firm of Morris, Marshall, Faulkner & Co.
As an untrained painter—with the exception of that self-imposed apprenticeship under Rossetti—he did not remain fixed in his ideas on sources for artwork; while other artists painted more conventional subjects from Shakespeare and 19th-century novels, Burne-Jones mined arcane classical and medieval literature. The same went for his use of varied media, leading to experimentation that may not have been possible for an artist working within the rigid parameters of a school. Going against academic art convention, Burne-Jones preferred to use oils as though they were a glaze to be built up and to thickly layer his watercolors to create opacity, most noticeable today in the bright highlights of zinc white. Very often his works in watercolor, already considered a forbiddingly feminine medium for a man, were mistaken for oil paintings and vice versa. Such criticism probably fueled his departure from the Old Water Colour Society in 1870. He also designed across an extraordinarily wide range of arts: paintings, drawings, prints, books (including those for Morris and Rossetti), furniture, and musical instruments, to name just some. Lagter, these ventures were sometimes dismissed in favor of calling him only a painter. (Again, Pevsner comes to mind.) In reality, Burne-Jones was so prolific as a designer—he produced over 270 designs for stained glass between 1872 and 1878 alone—that his oeuvre remains nearly impossible to solidify in a single catalogue raisonné. As demand for his work soared in the 1860s and ’70s, particularly the stained glass, Burne-Jones moved still farther from what history has come to understand as the archetypal 19th-century role of the artist and closer to an Italian Renaissance model of a workshop, employing artisans and students to work from his designs. Not unlike with Raphael and his sought-after cartoons for tapestries, Burne-Jones’s designs in wool proved enduring; Morris & Co. first executed the artist’s Adoration of the Magi tapestry in the late 1880s for their not-quite alma mater Exeter College, and over the next 20 years, the firm produced nine more tapestries, including the 1894 version later presented to the city of Manchester and now on view in London. This practice probably is not surprisingly given that the artist-designer would return to Italy twice more. During these trips he learned to retreat from Rossetti’s painterly example, taking instead as his guides Botticelli, Mantegna, and Luca Signorelli, among other quattrocento and cinquecento masters, whose oeuvres underlie the intricate and mysterious iconographic program of works like The Golden Stairs (1880). Desiderium (1873), given to the Tate in 1910 by the artist’s son Sir Philip Burne-Jones, is an exercise in both Michelangelesque materiality and ethereality. The androgynous head of Cupid in profile (a prime example of the effeminacy critics often accused Burne-Jones’ subjects of having) rests on an impossibly long and strong Mannerist neck, yet the rendering is so delicate, even diaphanous, that Cupid might lift off the paper and float away. In 1877, the Grosvenor Gallery displayed eight paintings by Burne-Jones to great fanfare, including The Beguiling of Merlin (1872–77). The following year, that canvas, along with the icon of post-troubadourian amour Love Among the Ruins (1870–73), traveled to the Exposition Universelle in Paris, opening the artist up to powerful, albeit brief, international accolades, especially among the Symbolists. In many ways, the Tate show picks up where these admirers left off more than a century ago. In 1890, The Legend of Briar Rose had been a must-see for any Londoner when Thomas Agnew & Sons on Old Bond Street displayed the four canvases together. The ladies’ magazine The Woman’s World called it “the art-sensation of the season.” Alexander Henderson, 1st Baron Faringdon, immediately purchased the Briar Rose series (for the princely sum of £15,000, or nearly $800,000 in today’s terms) to be installed at Buscot Park, Oxfordshire, with a series of custom friezes that tied the story together and integrated the scenes within Lord Faringdon’s music room. The canvases proved so popular, both in England and abroad, that Agnew’s Gallery published a widely circulated set of photogravures (a French technique combining photography and etching) after the four paintings. “Edward Burne-Jones” is no doubt the art sensation of this season. 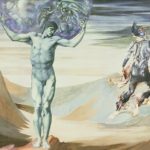 At Tate Britain, where the artist’s drawings, furnishings, instruments, and even caricatures will receive due attention alongside his better-known and more often-exhibited watercolors and oils, audiences will finally have a comprehensive picture of this versatile artist. They will also have the opportunity, for the first time ever, to see together his two masterpieces of painting cycles—and probably his two most important private commissions—The Legend of Briar Rose and Perseus. These two are exemplary of Burne-Jones’ mastery of the unconventional, both artistic and literary. Through his singular storytelling ability, by which passages and figures are dramatically duplicated—and further enhanced in Briar Rose by Morris’ added verses—Burne-Jones created visions of the fairy tale and the myth that seem both firmly rooted in Victorian England and timeless. In The Legend of Briar Rose, we witness the single moment of Sleeping Beauty’s repose from four perspectives—but all fundamentally the vision of Burne-Jones interpreting centuries of visual culture. The slumber of the kingdom and the Briar Wood encompasses three canvases, with the fourth, The Rose Bower (1885–90), culminating in the protagonist asleep with her attendants. Burne-Jones also paints The Death of Medusa from two distinct angles, essentially presenting the scene to the viewer in the round, lest we forget that the artist went to the trouble of making a wax model of the Gorgon. In the first version (1881), Burne-Jones depicted Perseus in the act, pulling Medusa’s head back while Pegasus looms over the body, which looks more like a Roman marble fragment of an Amazon warrior than a corpse so freshly decapitated that it has yet to hit the ground. In the second version (1881–82), Perseus reaches to place the head in a bag in order to avoid being turned to stone by her gaze. 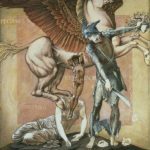 In 1875, Arthur Balfour (who would in 1902 become Prime Minister of England) commissioned Perseus for his London home, but the artist’s grandiose and ambitious proposal for a 10-scene cycle was never completed. 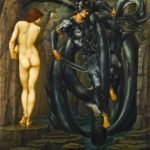 At Tate Britain, the Perseus cycle’s original four unfinished canvases, now at the Staatsgalerie Stuttgart, will be joined by the accompanying studies now preserved at the Southampton City Art Gallery and in the museum’s own collection, presenting for the first time Burne-Jones’s complex iconographic program in all its overwhelming glory. The exhibition also boasts an incredible array of works that museumgoers rarely get to glimpse, including those from private collections like Love Among the Ruins and the Orphic piano (1879–80) commissioned by the Glasgow MP William Graham for his daughter Frances, as well as several artworks lent by Andrew Lloyd Webber and Jimmy Page. 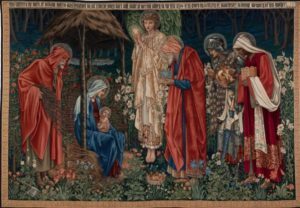 Where such figures of pop-cultural appreciation are concerned, Burne-Jones has been at the center of a post-Victorian reawakening since the 1970s Anglo-American revival of interest in his circle. The curators even point to Burne-Jones’s modern influence in art and music, suggesting that the anti-Pre-Raphaelite mantle of yesteryear’s historians has finally been completely shed. If the 20th-century reverence for anti-establishment art tells us anything at all, it’s that an artist of the untouchable caliber of Burne-Jones should probably receive the reverence due a demigod. 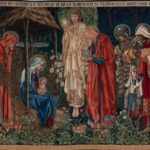 Maybe museumgoers don’t need to go to quite those lengths, despite Burne-Jones’s own spiritual leanings, but the Tate’s exhibition does drive home that Burne-Jones—the painter, draughtsman, designer, alchemist—did not paint “in defiance of who he [was],” but rather in defiance of who everyone else was.